The epigraph is quoted from Roderick Beaton’s George Seferis, Waiting for the Angel. 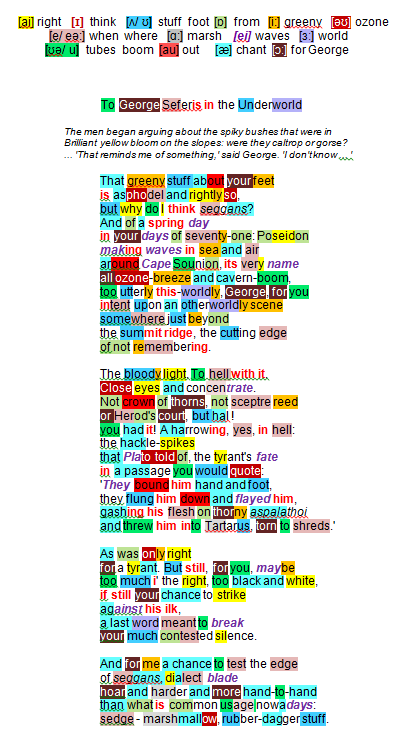 It sets off a number of lines of interest in Heaney: how a poet appears to observers, whether his thoughtfulnesses and preoccupations are mistaken for absent-mindedness; how a poet retrieves information; the extraordinary associations that the ‘poet’ dreams up in response to objects (here Heaney responds to ‘spiky’ sharpness). One characteristic Heaney recognises he shares with Seferis is his reluctance to take political sides in public. The poem is addressed to Seferis. Heaney portrays Seferis standing in spiky asphodel which grows wild in Greece (the same immortal flower that grew in Elysium, the abode of the blessed after death in classical antiquity), a rightly appropriate setting for a poet with Seferis’ nature. What comes to Heaney’s mind is a very different plant growing wild in Ireland: why do I think seggans? He conjures up a particular moment in the year of the poet’s death (your days of ’71) watched by the mythological god of the sea as Seferis stood on a Greek promontory south of Athens. To Heaney the spot was rich in immediate sense data, all ozone-breeze and cavern-boom that make little impact on Seferis’ consciousness: too utterly this-worldly, George, for you. The Greek’s mind is elsewhere, intent upon an otherworldly scene, as he struggles to assemble facts that lie in the back of a mind threatened by memory loss : just beyond/ the summit ridge, the cutting edge/ of not remembering. He reports the Greek’s cantankerous reaction to the bright sunlight: The bloody light. To hell with it. close eyes and concentrate. Seferis’ point de départ is based not on Jesus Christ’s suffering, a ‘good’ man condemned to his crown of thorns and crucifixion in a Herod’s court but something remembered from Plato: the hackle-spike fate rightly subjected tyrants to in Tartarus … torn to shreds in the Underworld pit of Hell by the very asphodel Seferis is standing in (a harrowing, yes, in hell, flayed with thorny aspalathoi). It appeals to Heaney’s sense of justice: as was only right for a tyrant. For you … Heaney reflects on the reasons why the unpalatable political tyranny Seferis was experiencing in Greece, perhaps because of the way he was (maybe/ too much i’ the right, too black and white), had not yet provoked him to publish a reaction … yet there was still time: still your chance to strike against his ilk. Heaney acknowledges the need for some ‘last straw’ triggering a public outburst deploring the current state of affairs: a last word meant to break your much contested silence. Seferis did ultimately make a ‘statement’ and became a symbol of free expression and freedom especially in the minds of young Greeks. Heaney, aware of his own (for me) timidity as regards Irish politics during the years of sectarian chaos in Ulster weighs up (a chance to test the edge) his own ‘weaponry’ in the Irish arena (seggans, dialect blade), etymologically stronger than ‘asphodel’ – it shares its root with the word for ‘sword’ – hoar and harder and more hand-to-hand once a symbol of combativeness, replaced now by weedier approaches that lack substance (sedge – marshmallow) and come a poor second (rubber-dagger stuff). Seferis is dead; Heaney’s title is one of five in the collection that allude to death; here he uses the Greek classical reference to the Underworld . The poem’s ‘action’ would appear to take place very shortly before Seferis’s death in 1971. Seferis witnessed the1967 military coup in Greece following which a junta of ‘Colonels’ ruled for 7 years using a puppet government; correspondingly Heaney was caught up political turmoil surrounding the Irish ‘Troubles’. Seferis is reported as having been particularly opposed to ‘puppet’ Prime Minister Papadopoulos; Heaney hints that, rightly or wrongly, he and Seferis were both reluctant to take sides in public.